In April's election, voters in La Crosse and Vernon counties had a county advisory referendum on their ballot. They were asked if they support a nonpartisan redistricting reform process. The advisory question passed overwhelmingly (77% in La Crosse County and 71% Vernon County). These margins are consistent with referendum results seen previously in six other counties with citizen advisory referendums in 2014 and 2018. 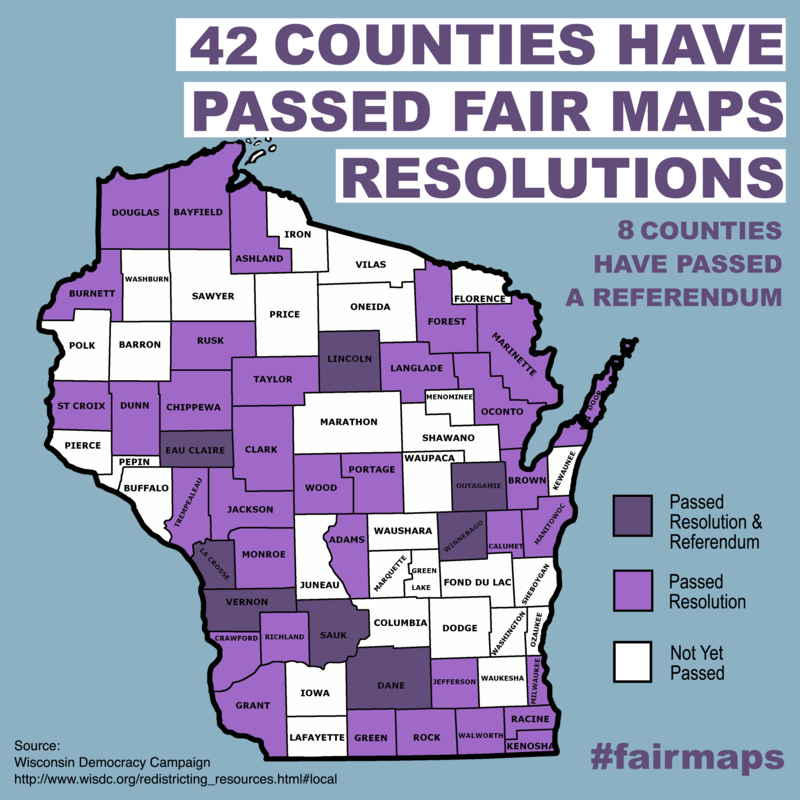 Currently, 42 county boards have passed resolutions asking the state of Wisconsin to adopt nonpartisan redistricting in typically blue and red counties. As the League has always advocated, gerrymandering is not a problem just of the Democrats or just of the Republicans, it’s a power problem. It’s great to see the grassroots movement for a fair maps process continue to grow across the state. Congrats to the coalition of local groups including the League of Women Voters of the La Crosse Area, Driftless Voter Coalition, and Vernon Friends of Fair Maps who put together the referendum and educational forums on the issue of gerrymandering. The fight for a nonpartisan, independent commission has been championed by the League in Wisconsin since the 1970s while both Democrats and Republicans have had control of the state government. Now is the time for both parties to recognize a fairer process of map drawing. Lawmakers need to be accountable to voters and support legislation that will take the power of map-drawing out of partisan control and give it to an independent body, with plenty of public input, in the interest of fairness and democracy. If you are interested in learning what you can do in your area, contact our office.